When a monolayer of negatively charged surfactant molecules is brought in contact with an aqueous solution containing mixtures of counterions of different size and valency, very large deviations from Poisson–Boltzmann theory (PBT) develop at a high surface charge, with the smaller counterion outcompeting the larger one (even if divalent) near the interface, leading to counterion segregation [V.L. Shapovalov, G. Brezesinski, J. Phys. Chem. B 110 (2006) 10032]. We use a modified PBT that empirically includes an extended Carnahan–Starling equation-of-state to describe hard-sphere interactions in electrical double layers containing ions of different size and charge. Model calculations are made for ion concentration profiles, free energies, surface pressures, and differential capacities. At high surface charge, volume interactions become important, leading to significant deviations from PBT. 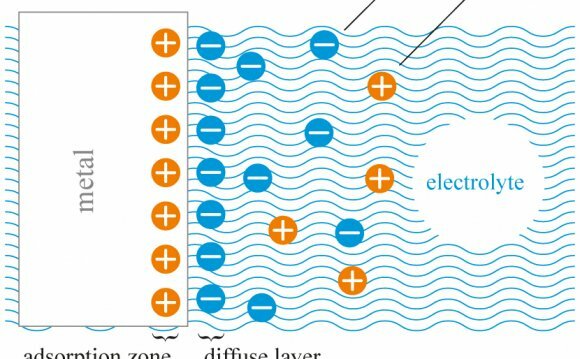 In contrast to PBT, at high surface charge, contributions to energy and pressure are no longer mainly entropic, but instead volume and electrostatic field effects now dominate. When the hydrated size of the divalent ion is used as an adjustable parameter, the theory is in good agreement with the experimental data. In a mixture of ions of different hydrated size, at high enough surface charge, larger divalent ions are expelled from the interface by smaller counterions.